We bring training classes to cities throughout North America on our World Tour. Training is interactive and hands-on at a computer, and facilitated by Car-Part product experts. Topics include Car-Part Pro, Car-Part mobile apps, Images, Core Pricing and sales, CrashLink, Bidmate for buying, Checkmate Sales Pro Boot Camp, Partmate for inventory and assemblies, Car-Part Interchange Plus, Brokering, eBay through Checkmate, Reports, and more. Emphasis on hands-on and personalized software training, business seminars and industry updates. Select materials made available online following the conference for customer's review. 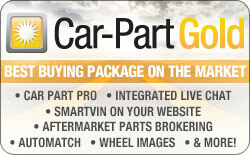 This website includes written and video training modules for Car-Part.com products. Available to all Car-Part.com customers. Updated regularly. Interactive online webinars (such as Checkmate Sales Pro Boot Camp) include live instructors, personalized coaching, and software simulations. Car-Part.com trainers travel to your location for one-on-one, in-person training with your staff. Small groups of recyclers meet several times a year with Car-Part facilitators to share ideas, analyze their businesses, and solve problems in a confidential environment. Support "chat rooms" staffed daily via Car-Part Messaging. Request and receive help on-the-spot from experienced support staff throughout the work day as needed. Contact our main office to talk to a support rep over the phone or discuss other training options at 859-344-1925. Car-Part also offers support and training to insurers and repairers on Car-Part Pro and Car-Part EMS Pro.